Susanne Katherina Langer (née Knauth) (December 20, 1895 – July 17, 1985) was an American philosopher of mind and of art, who was influenced by Ernst Cassirer and Alfred North Whitehead. She was one of the first women to achieve an academic career in philosophy and the first woman to be popularly and professionally recognized as an American philosopher. 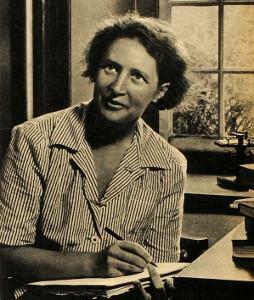 Langer is best known for her 1942 book entitled, Philosophy in a New Key. Langer was born in Manhattan, the daughter of German immigrants Antonio Knauth, a lawyer, and Else M. (Uhlich) Knauth. German was spoken exclusively at home and she never completely lost her accent. As a girl, Langer learned to play both the cello and piano. For her early education she attended the Veltin School for Girls. She studied at Radcliffe College, receiving her bachelors degree in 1920 and her doctorate in 1926. Alfred North Whitehead was her dissertation adviser. She taught at Radcliffe, Wellesley College, Smith College, and Columbia University. She was a visiting lecturer at a number of other institutions. In 1941 she met Ernst Cassirer, whose work The Philosophy of Symbolic Forms, she had read in the 1920s. It had greatly influenced her thinking. Recognizing their common ground, Cassirer remained in close contact with Langer until his death in 1945. In 1921 she married William L. Langer, who later became a history professor at Harvard. They had two sons, Leonard born in 1922 and Bertrand born in 1925. During the late 1930s they drifted apart and were divorced in 1942. From 1952 to 1962, Langer was professor of philosophy at Connecticut College. She was elected to the American Academy of Arts and Sciences in 1960. In 1956 she was awarded a grant from the Edgar J. Kaufmann Foundation that allowed her to devote the remaining 25 years of her life to research and writing. Langer died in Old Lyme, Connecticut on July 17, 1985 after finishing the third volume of her magnum opus, Mind: An Essay on Human Feeling. Langer's philosophy explored the continuous process of meaning-making in the human mind through the power of “seeing” one thing in terms of another. Langer's first major work is entitled, Philosophy in a New Key. It put forth an idea that has become commonplace today: that there is a basic and pervasive human need to symbolize, to invent meanings, and to invest meanings in one’s world. Beginning with a critique of positivism, the work is a study of human thought progressing from semantic theory through philosophy of music, sketching a theory for all the arts. For Langer, the human mind "is constantly carrying on a process of symbolic transformation of the experiential data that come to it," causing it to be "a veritable fountain of more or less spontaneous ideas". Langer's distinction between discursive versus presentational symbols is one of her better known concepts. Discursive symbolization arranges elements (not necessarily words) with stable and context invariant meanings into a new meaning. Presentation symbolization operates independently of elements with fixed and stable meanings. The presentation cannot be comprehended by progressively building up an understanding of its parts in isolation. It must be understood as a whole. For example, an element used in one painting may be used to articulate an entirely different meaning in another. The same principle applies to a note in a musical arrangement—such elements independently have no fixed meaning except in the context of their entire presentation. Langer believed that symbolism is the central concern of philosophy because it underlies all human knowing and understanding. As with Ernst Cassirer, Langer believed that what distinguishes humans from animals is the capacity for using symbols. While all animal life is dominated by feeling, human feeling is mediated by conceptions, symbols, and language. Animals respond to signs, but stimulus from a sign is significantly more complex for humans. The perspective also is associated with symbolic communication where animal societies are studied to help understand how symbolic communication affects the conduct of members of a cooperating group. Langer is one of the earliest philosophers who paid close attention to the concept of the virtual. Inspired by Henri Bergson's notions of matter and memory, she connected art to the concept of the virtual. For her, figuring out the space of an art work by its creator was no less than building a virtual world. She describes virtuality as "the quality of all things that are created to be perceived." For her, the virtual is not only a matter of consciousness, but something external that is created intentionally and existing materially, as a space of contemplation outside of the human mind. Langer sees virtuality as a physical space created by the artist, such as a painting or a building, that is “significant in itself and not as part of the surroundings.” She particularly considers architecture not as the realization of a space for being, but its conceptual translation into virtuality for perceiving: “The architect, in fine, deals with a created space, a virtual entity.” In contrast to Bergson, for Langer virtuality is tangible and can cause a contemplative interaction between humans and the machine. In her later years, Langer came to believe that the decisive task of her work was to construct a science and psychology based theory of the "life of the mind" using process philosophy conventions. Langer's final work, Mind: An Essay on Human Feeling represents the culmination of her attempt to establish a philosophical and scientific underpinning of aesthetic experience, relying on a three volume survey of a comprehensive set of relevant humanistic and scientific texts. Susanne Langer’s work with symbolism and meaning has associated her with contemporary Rhetoric, although her influence in the field is somewhat debated. Langer established the use of symbols as the “epistemic unit of community”, suggesting that all knowledge in a community is gained and built from shared symbol systems within a given culture. Langer’s concept regarding language and dialogue may be understood to imply that language does not simply communicate, but it produces symbols from which humans then create their own reality. Claimed support of this perspective is from Langer’s statement that “language is intrinsic to thinking, imagining, even our ways of perceiving”. According to Arabella Lyon, Langer's opinion is that meaning arises from the relationship between a community, its discourse, and the individual. Lyon suggests that Langer’s work may be viewed as a contradiction to the comparatively traditional theories of Aristotle, by way of Langer’s argument that discourse is formed through sensory experiences shared between speaker and hearer, rather than through logic as advocated by the philosopher. Langer’s epistemic view of symbolism and language, which further examines the motivation of the speaker, the influential aspects of language that affect people, and the relationship between the speaker and the community, are often reflected in aspects of modern rhetorical studies. ^ Susanne K. Langer, Feeling and Form (Charles Scribner’s Sons, 1953), 65 and 114–115. ^ a b c d Lunsford, Andrea (1995). Reclaiming Rhetoric: Women in the Rhetorical Tradition. Pittsburgh, PA: University of Pittsburgh Press. pp. 265–284. ^ a b Innes, Robert (2008). Susanne Langer in Focus: The Symbolic Mind. Bloomington, IN: Indiana University Press. Petri Liukkonen. "Susanne K. Langer (1895-1985)". Books & Writer's Calendar. Retrieved 2010-03-19. Anthony Flood. "Susanne K. Langer". Retrieved 2010-03-19. Essays by and about Langer.